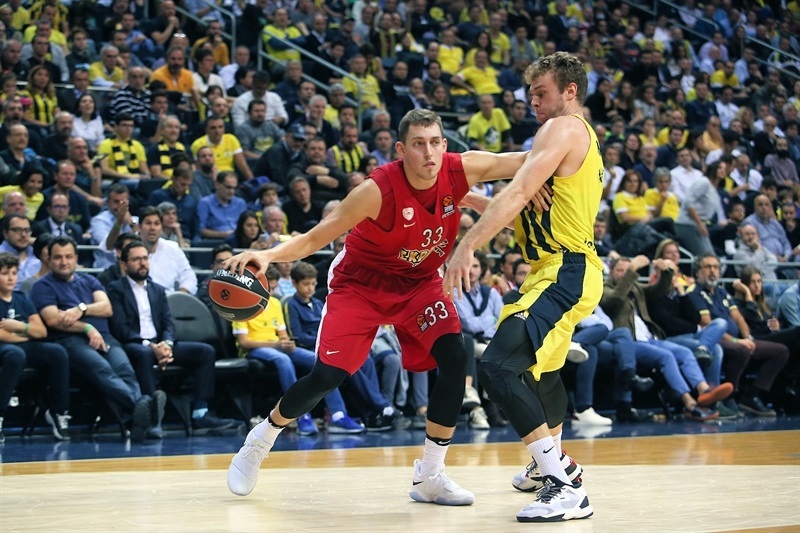 In a rematch of last season’s Turkish Airlines Championship Game, a thrilling clash that went into overtime, visiting Olympiacos Piraeus prevailed over reigning champion Fenerbahce Dogus Istanbul 83-90 on Wednesday night. 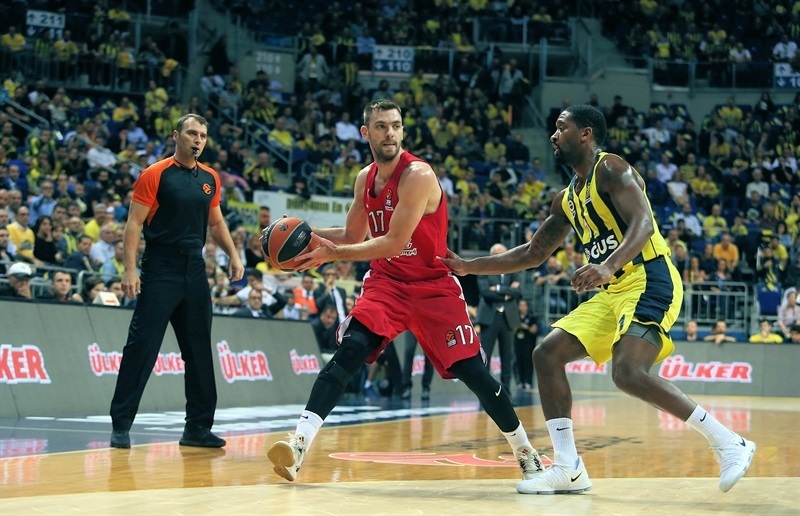 Olympiacos improved to 5-2, while Fenerbahce dropped to 4-3 after a game in which each team held a double-digit lead. 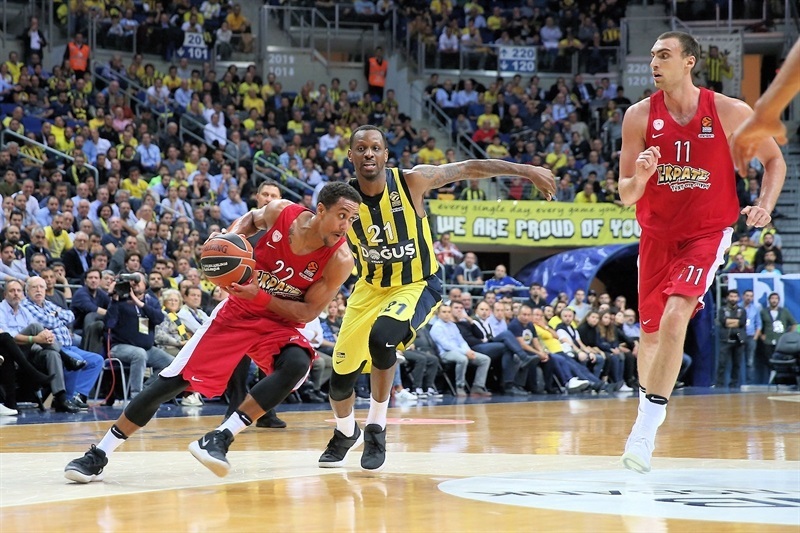 Fenerbahce led by 13 early in the third quarter, but a 4-20 charge during which Brian Roberts hit 4 triples without a miss put Olympiacos in front. The hosts never led again, but did rally from an 11-point fourth-quarter deficit to force overtime. 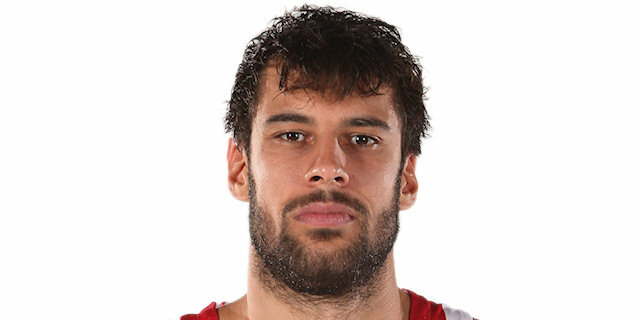 However, Georgios Printezis strung together 6 points in the extra minutes to lift the Reds to victory. Roberts scored 21, and Printezis had 18 points and 7 rebounds to lead the Reds. 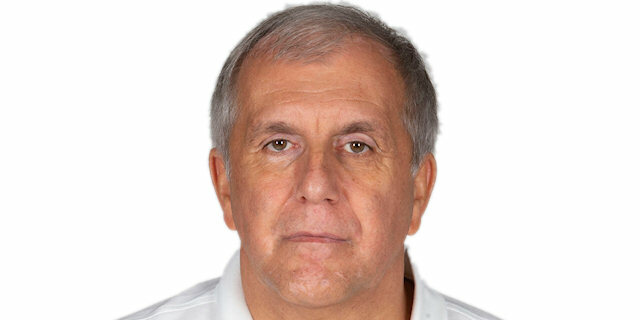 Janis Strelnieks added 16 points, while Nikola Milutnov contributed with 10 points in victory. James Nunnally netted 22 points in defeat. 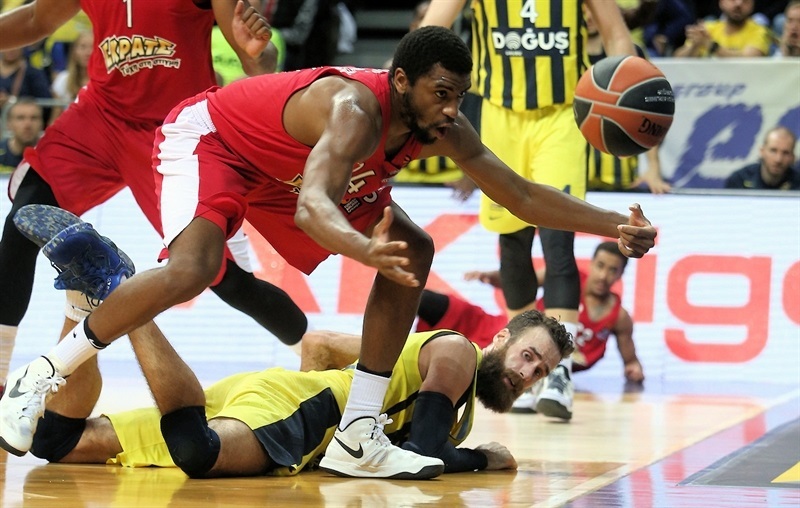 Brad Wanamaker had 15, Kostas Sloukas scored 13 and Nicolo Melli 11 for Fenerbahce. 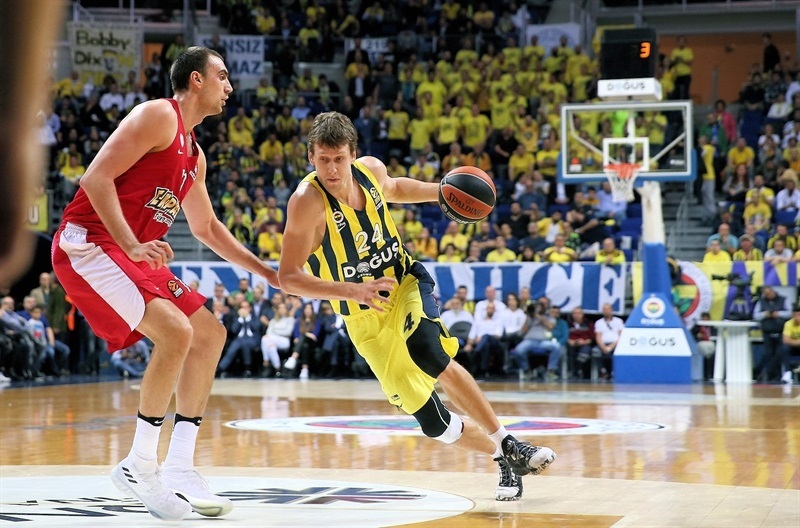 Jan Vesely had a pair of layups, and Luigi Datome and Nicolo Melli connected from behind the arc to give Fenerbahce an early 10-5 lead. Olympiacos turned things around going through its front court. Nikola Milutinov scored from close range, and Printezis found different ways to score inside, putting up 10 first-quarter points as the visitors opened a 14-18 lead. Sloukas hit a jumper to close the deficit to 17-18 at the end of first, and Melli and Nunnally combined to put Fenerbahce in front 24-18 early in the second quarter. 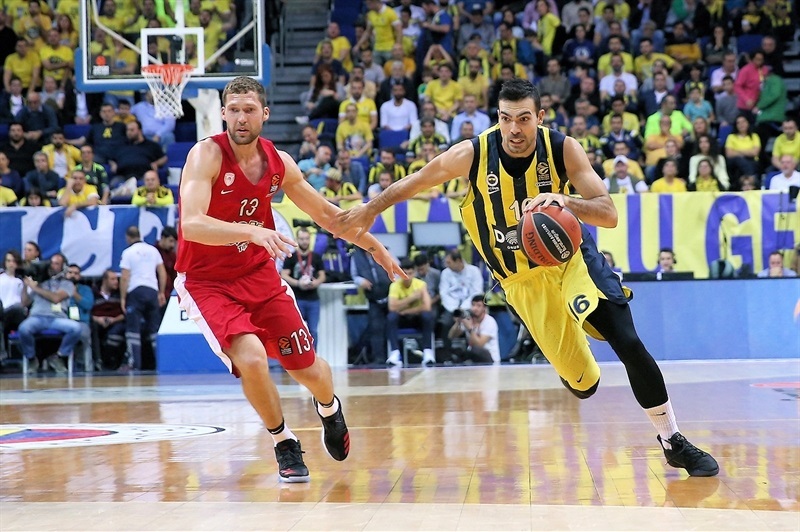 Fenerbahce defense, with an occasional full-court press, started to dominate. Roberts did snap a 10-0 run with his first triple, but Nunnally answered with a three of his own, as the hosts opened a 31-23 margin. 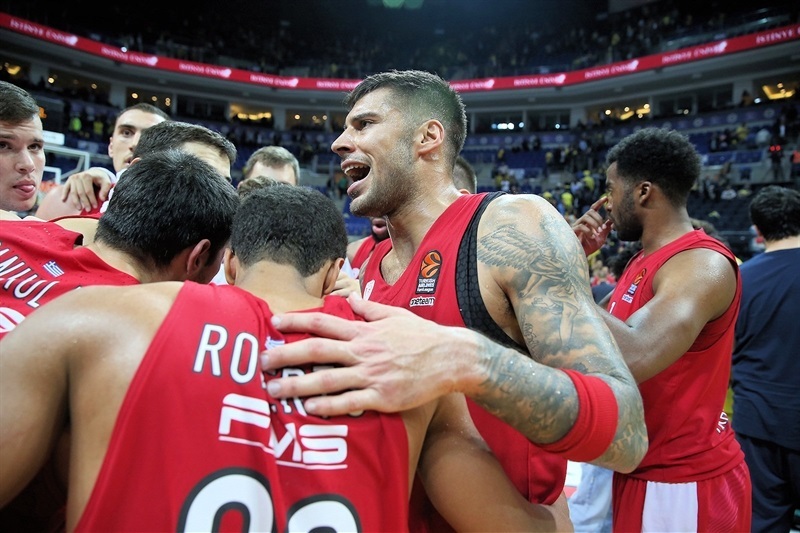 The Reds did have an answer, as Strelnieks hit from long range and Jamel McLean had a big put-back dunk, as Olympiacos got within 31-30 and prompted Coach Zeljko Obradovic to call a timeout. 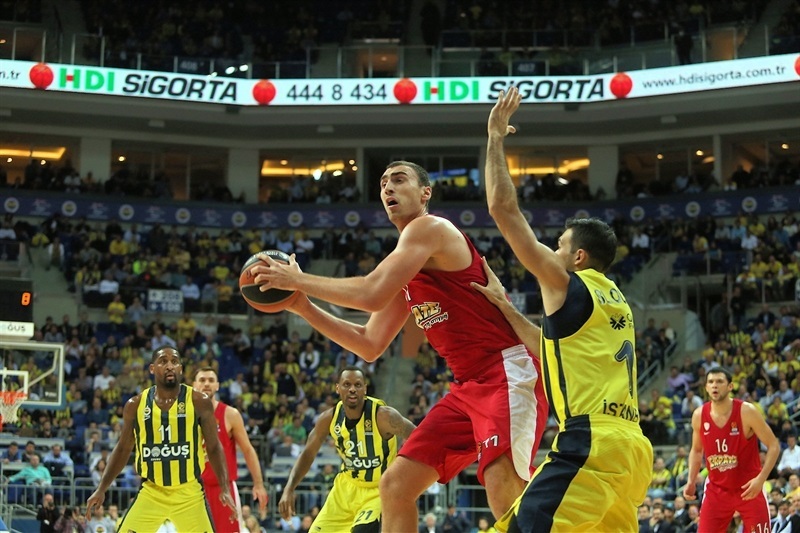 It led to Fenerbahce stepping it up on defense and not allowing a single point in the final three minutes of the half. Meanwhile, Datome had a three-point play, and a steal that sent Nunnally to an easy breakaway dunk, as Fenerbahce took a 40-30 advantage into halftime. Fenerbahce extended the lead to 13 points with a wide-open three-pointer from Wanamaker, but Roberts got hot. He nailed a pair of triples and then added his third consecutive triple to cut the deficit to 49-45. Sloukas made a baseline floater, but that turned out to be the only Fenerbahce field goal in the final 7:35 of third quarter. Hollis Thompson spun his way to the basket, then hit a three-pointer that put the Reds in front 51-52. 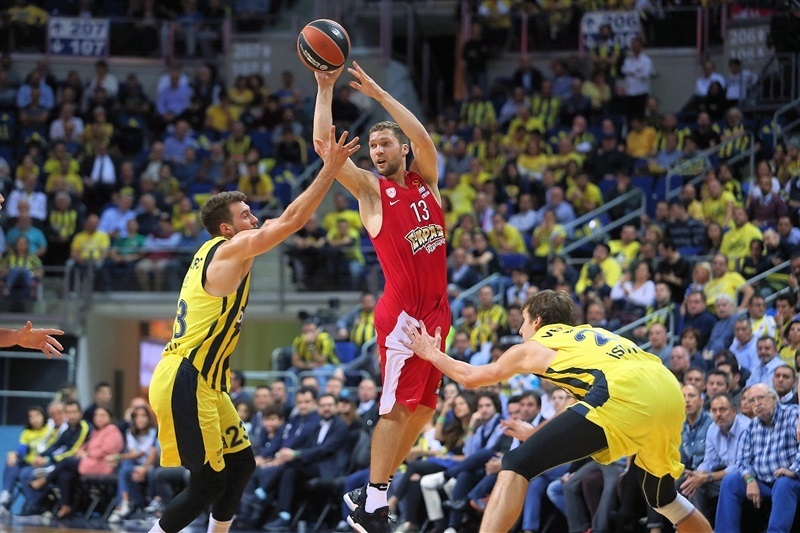 The fourth triple in the quarter by Roberts gave Olympiacos a 53-57 at the end of the third quarter. Sloukas opened the fourth quarter with a three-pointer, but McLean had a three-point play and then muscled his way for a basket inside that made it 56-62. A tough runner off the glass by Roberts, a triple from Strelnieks and a Kostas Papanikolaou put-back of a loose ball opened 60-71 visitors’ lead. Nunnally answered with a three-pointer and after a Milutinov dunk, Nunnally hit another one from downtown. Wanamaker added a transition triple, too, getting within 69-73 with 1:45 to go in the fourth. Despite Milutinov adding another easy dunk, in the final 48 seconds of regulation, Sloukas, Datome and Vesely each hit a pair of free throws to tie things at 75-75. Roberts had the last shot, but missed it and the game went into overtime. In the extra session, Roberts and Wanamaker traded quick baskets, before Papanikolaou inside and Stelnieks with a baseline jumper made it 77-81. Wanamaker made free throws, but Printezis scored inside, then made back-to-back put-backs to open a 79-87 lead. A Strelnieks triple on the ensuing possession sealed the outcome. "It was a great game for everybody. We had a great reaction after the two losses we had. It was important for us that we stayed focused until the last second. We never gave up. It looked as a game we could have won much easier, but went into overtime where we showed character. 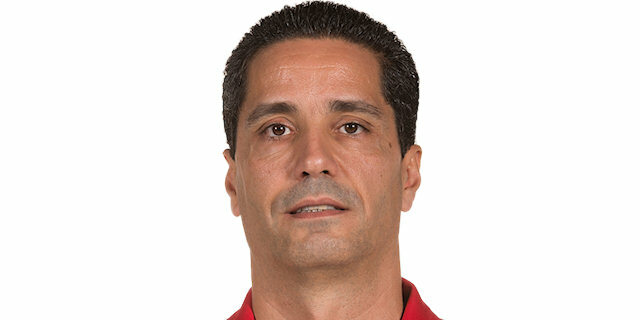 And it is a very good win for us."